Pak Beng: My experience in the past of crossing borders, coming from Europe, can be explained by finding out the language at the next highway gas station is different. Traveling through Asia, the experience of changing countries and borders can be somewhat different. 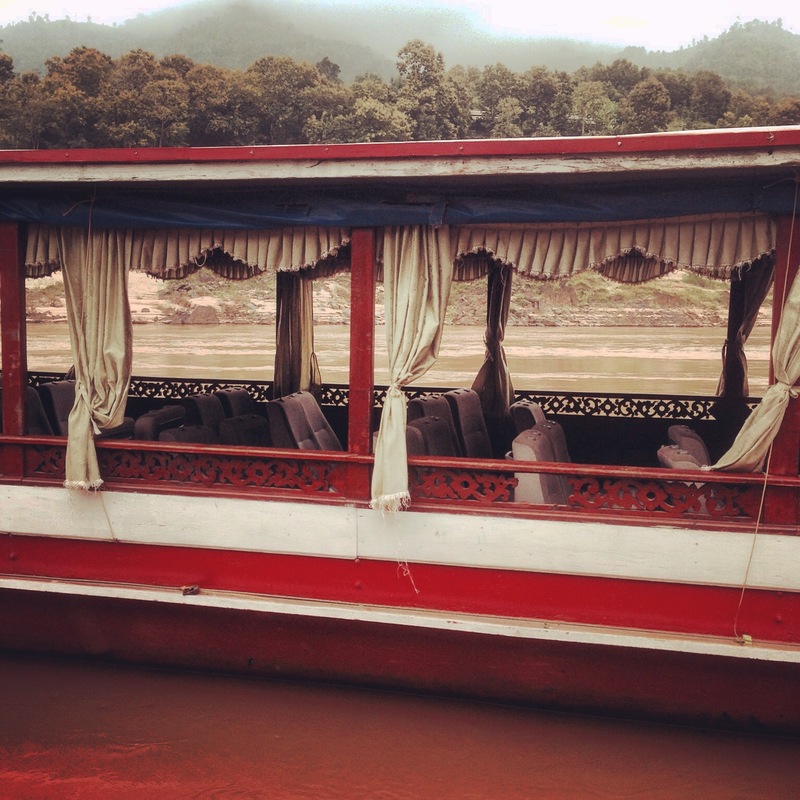 Crossing over from Chiang Rai to Luang Prabang we had to stay 1 night in Pak Beng. There we experienced: 14 hours of Mekong river, the shittiest grossest hell hole guesthouse ever, Dollars above local Lak currency, bands and friends are made every where, and the prettiest scenery that not even a Lord of the Rings movie could exceed. Slow Boat: Originally we came from Pai but we made a stop in Chiang Rai before going to Laos to take the trip a bit slower. However we discovered that the trip was a lot cheaper if we went straight from Pai: 2100 Baht in total with accommodation and transport. Now, from Pai to Chiang Rai we paid 550 Baht and another 1600 Baht from Chiang Rai to Luang Prabang with slow boat transportation but without accommodation. 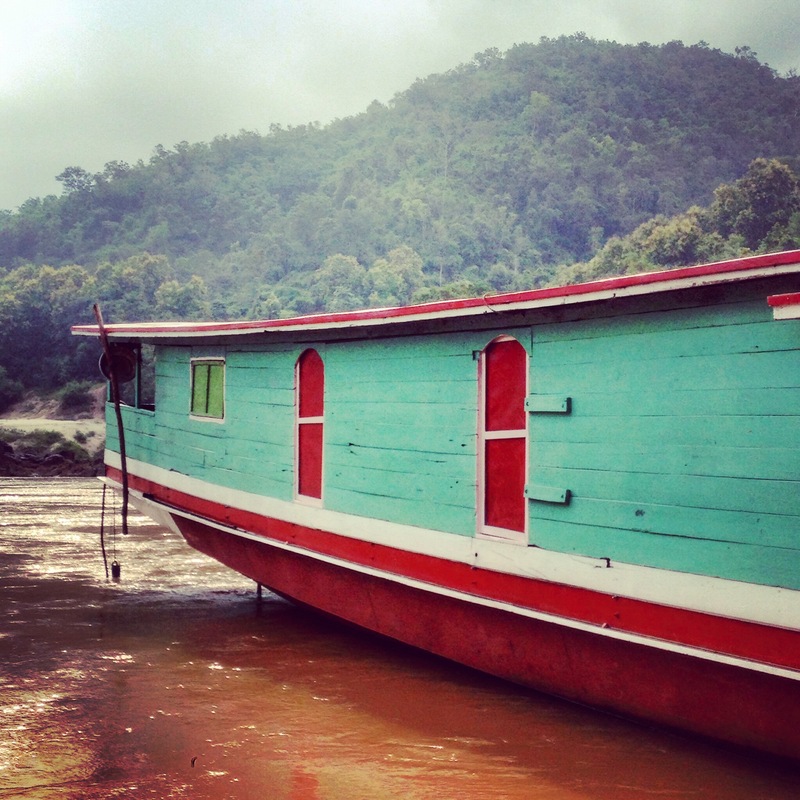 The slow boat is two day experience of cruising across the Mekong river and sleeping in a small village in between called Pak Beng. Before boarding the slow boat we went through the most confusing customs by loosing our guide for at least 1 hour and finding out that paying in Dollars is a lot easier and cheaper than wanting to pay in the local currency for a visa. We ended paying 10 euro’s more than the rest after calculating the difference because we wanted to pay in Lak. We quickly met 2 other wanderlustic travelers, what would only be the beginning of new friendships to be made. We then were escorted from the boarder to a small house in the middle of nowhere where we could buy sandwhiches and we got a speech from a guy you said he would be our guide for the entire trip and that he would be our spokesperson for the whole journey… we never saw this guy again during the entire trip. Strange. Then we boarded a wooden long boat that had old car chairs loosely placed in it and in the back of the boat, next to the booming motor, lived an entire family in small bunk beds and would thus travel with us from place to place as we now took up their home. The crappiest chairs were given to us and other backpackers and we thought that this was going to be the beginning of a very long trip, but we couldn’t have been more wrong. The first cold beers were bought in the back and then the second, third and then we lost count. We met the most interesting group of backpackers some who’ve meditated for 3 weeks in temples, were archeologists, professional photographers and so many of them quit their jobs from being doctors, professional singers to people in PR (what a coincidence) from ages 25 to 45 and from Mexico, France, United States and also The Netherlands. The boat ride was beautiful and felt like a combination of the Egyptian Nile river due to the sandy waters and banks of dry dessert like sand on both sides of the river. This was an amazing contrast with the huge towering green clouded Lime Stone mountains with goats and cows grazing over them through the patches of thick jungle. 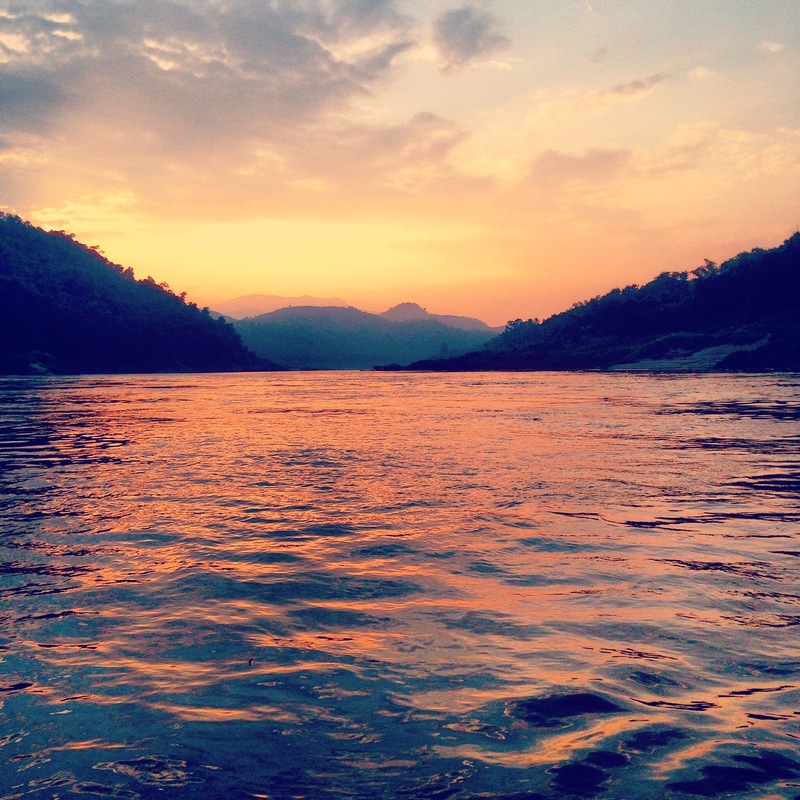 The scenery let you drift off in wonderland, especially when the sunrise came through and was reflected on the rippling current of the Mekong. The current was immense strong and had many coils in the water all over. The bathroom on the boat next to the thumping loud motor was more like a swimming pool of pee so brace yourself when entering. Together with the group of backpackers the ride was easily filled with talks and philosophical thinking, for instance about pyramids in Egypt and the strangely comparable ones in Mexico & how those countries both came up with that shape so far away from each other. Or why people were traveling and where they were going next. The time was also filled with 3 people spontaneously popping out their guitar after each other and 3 raising their voices to sing along with the tunes (my skills were left to swaying and clapping, also very important). 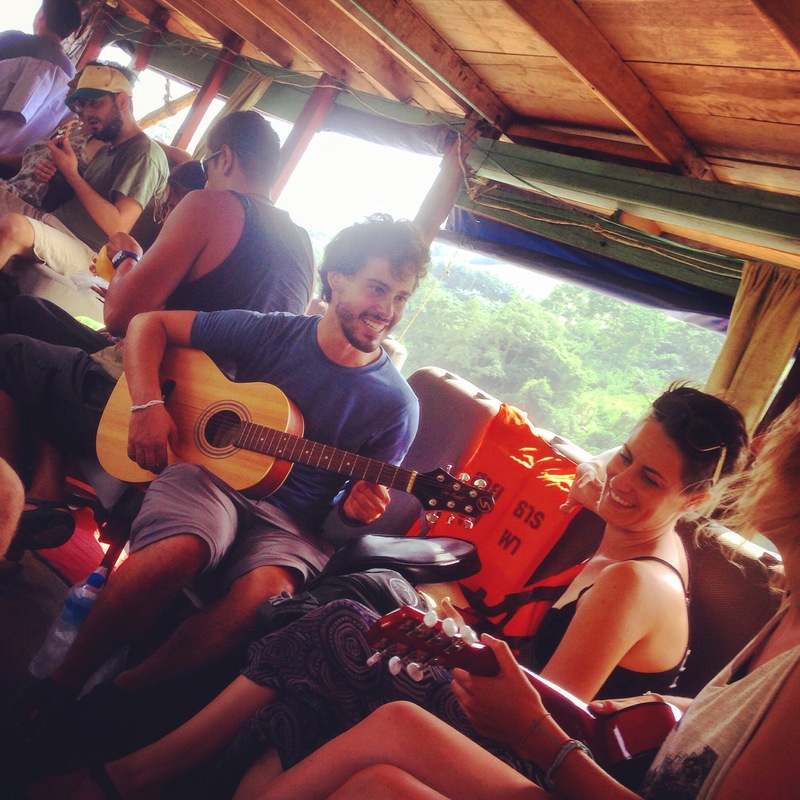 We had a cliché Kumbaya sing a long travel story, like the amazing trips you’ll read about in all the travel books. But this was one that I won’t forget. 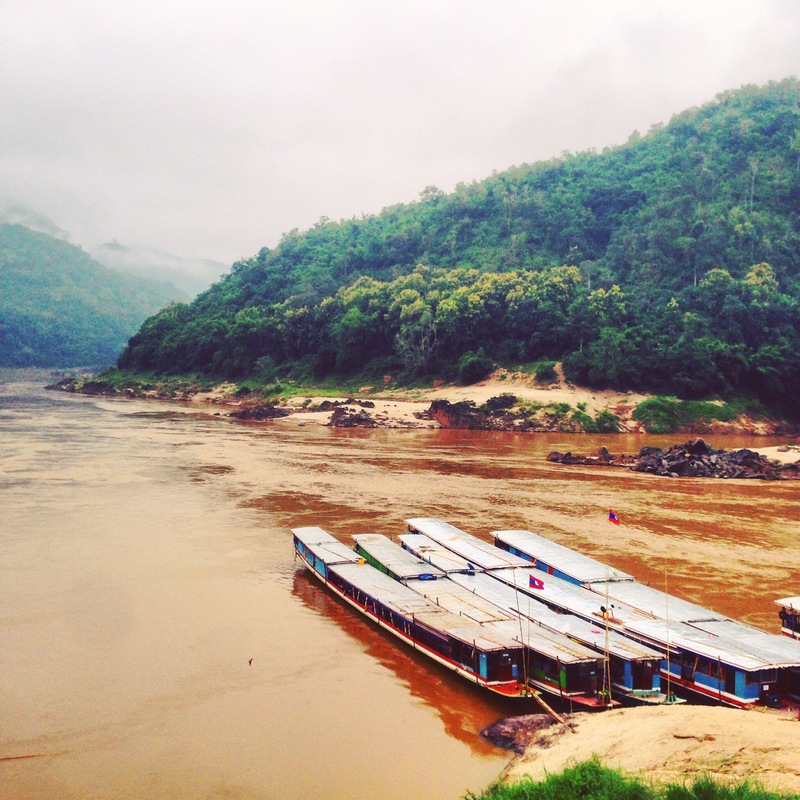 Unknown Hell Hole: The boat ride takes two days with a stop in between at Pak Beng which meant finding a sleeping room when we got there. We ended up in the most hell hole for 1 dollar, but what else would you expect. The beers made the stay better plus for some a small puff puff made their stay even more chilled out. 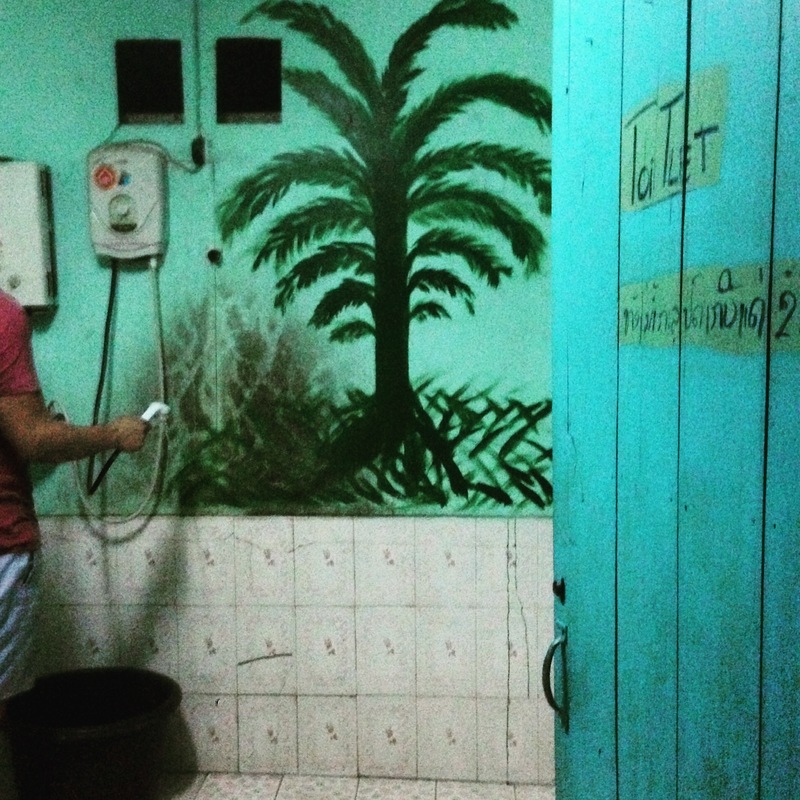 For us however, the broken wooden floor boards covered in a plastic sheet combined with a shower where someone absolutely died in, made this hostel look like a replica of the movie ‘A House of a Thousand Corpses’. I’d recommend to look a bit further and maybe even book in advance after a 7 hour boat ride, just to get some shut eye for the next day filled with 7 hours floating. For tips on other places I’ve visited check my older posts such as: Canggu, Kuala Lumpur, Bangkok & More. Keep you updated and posted, until then Korp Jai! haha! Ik wist dat je hierom zou lachen ;), Ik heb ook een mooi wc verhaal waar je helemaal gek van wordt! Liefs van ons!